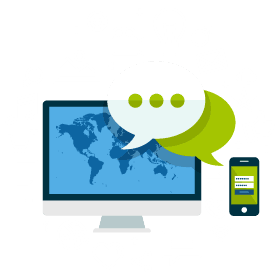 We pride ourselves on delivering compelling, digital marketing solutions. Our winning solutions and experiences help many of our clients interact and engage with their customers in the most meaningful way possible. Customers are actively interacting with brands through social media. Once implemented correctly, SMM can deliver remarkable results. Search Engine Optimisation is fundamental for all brands. Our SEO strategies deliver high-ranking positions in Google search results. Our services cover all aspects of Google Analytics, from initial setup to integrations of advanced tracking solutions, custom features, dashboards and reports. Our custom Email Marketing services leverage marketing automation to save time and money. Integrate inbound call data with PPC campaigns and Google Analytics. Paid listings on Google AdWords, Bing & Facebook to reach new customers. Custom email templates that resonate with your customers. Inspire targeted users to resolve their journeys faster and reach a favourable decision sooner. We combine creative ideas with our vast experience in search technologies to deliver measurable results for our clients. We can help you build a sustainable, meaningful relationship with your clients by engaging them with your brand using multiple digital marketing platforms.